iPhone app response: In the last 35 years of global warming, the sun has shown a slight cooling trend. Sun and climate have been going in opposite directions. As can easily be seen, the “cooling” of the sun in the last 35 years is minor in comparison to the over all trend. In fact, a more reasonable assessment is that the sun’s steadily increasing intensity over the last 300 years began to level off about 35 years ago. If you put a pot of water on a hot stove burner, it does not heat up instantly. You can even turn the burner down a bit, as long as it is putting more heat into the pot than is coming out, the water will continue to heat up. So the last 35 years of the Sun’s intensity is meaningless in the big picture. That said, we have seen the upward temperature trend of the earth’s temperature slow down and become flat for the last 15 years, possibly even declining slightly, despite CO2 levels being at their highest point. iPhone app response: Natural climate change in the past proves that climate is sensitive to an energy imbalance. If the planet accumulates heat, global temperatures will go up. Currently, CO2 is imposing an energy imbalance due to the enhanced greenhouse effect. Past climate change actually provides evidence for our climate’s sensitivity to CO2. Past climate change shows sensitivity to a wide variety of factors, not just CO2. In fact, geologic climate reconstructions show that warming trends precede (not follow) increases in CO2. The warmist argument attempts to make the case that increases in CO2 due to warming oceans (CO2 is less soluble in warm water than cold, so warming releases dissolved CO2) simply accelerate the warming trend. If that were true, we would expect to see continued warming after CO2 had peaked, just like we see summer temperatures in the northern hemisphere peak in July and August, a few weeks after the peak in the Sun’s intensity in June. Instead we see that when temperatures fall, they drive the CO2 levels down too, showing that what ever the main driver of planetary temperatures is, it over whelms CO2. The current record shows the same thing. There were cooling trends in the 1950’s and again in the 1970’s, in defiance of increasing levels of CO2. The planet’s temperature has been flat or cooling for the last 15 years, while the warming effects of CO2 have been at their absolute maximum, showing once again that there are other processes at work that are more significant than the supposed warming from CO2. iPhone app; That humans are causing global warming is the position of the Academies of Science from 19 countries plus many scientific organisations that study climate science. More specifically, 97% of climate scientists actively publishing climate papers endorse the consensus position. What the ClimateGate emails show is the lengths to which scientists with a warmist position went in order to suppress dissenting opinion and attempt to derail the careers of their critics. When Dr. Joanne Simpson (deceased), one of the world’s pre-eminent climate researchers retired, one of the things that she said was that now that she was no longer affiliated with any organization, she could speak her mind. She went on to say that due more to caution than anything else, she thought that the IPCC recommendations should be followed, but “as a scientist I remain sceptical”. This shows the enormous political pressure that climate scientists are under, and how difficult it has been for those with a skeptic view to express it and maintain their funding. Since the ClimateGate emails there have been a raft of papers published poking gaping holes in the warmist arguments, their authors finally being able to speak their minds. The societies that supposedly endorse global warming theory have reiterated their beliefs in the radative physics of CO2, but they have been highly critical of the manner in which climate science as a whole has been conducted. iPhone App; Empirical measurements of the Earth’s heat content show the planet is still accumulating heat and global warming is still happening. Surface temperatures can show short term cooling when heat is exchanged between the atmosphere and the ocean, which has a much greater heat capacity than the air. iPhone App; While there are uncertainties with climate models, they successfully reproduce the past and have made predictions that have been subsequently confirmed by observations. iPhone App; Numerous studies into the effect of urban heat island effect and microsite influences find they have negligible effect on long term trends, particularly when averaged over large regions. This statement is impossible to prove since we don’t have a temperature record with no urban heat island effects at all to compare too. Some scientists are trying to construct one, and it will be interesting to see their results. That said, we don’t have many temperature readings from around the world before the late 1800’s at all. In terms of understanding climate change which occurs over decades and centuries, that is far too short a record to be considered reliable. Further, it is not the trend itself that most skeptics dispute. It is the amount of the trend that can be attributed to CO2 versus other factors. iPhone App; The planet has continued to accumulate heat since 1998 – global warming is still happening. Nevertheless, surface temperatures show much internal variability due to heat exchange between the ocean and atmosphere. 1998 was an unusually hot year due to a strong El Nino. iPhone App; 1970s ice age predictions were predominantly media based. The majority of peer reviewed research at the time predicted warming due to increasing CO2. There was a lot of media driven hysteria about an impending ice age in the 1970’s. As the detailed iPhone App article points out, this was due to some scientists noting a three decade long cooling trend and assuming it would continue for the long term. The point here is not that they got it wrong, but that there was a three decade long cooling trend right when CO2 emissions were taking off. What ever was driving that cooling trend clearly was significant while CO2 emissions were not. The current three decade warming trend can no more be extrapolated into the long term than the three decade long cooling trend that ended in the 1970’s could be. iPhone App; The warming effect from CO2 increases greatly outstrips the influence from orbital changes or variations in solar activity even if solar levels were to drop to Maunder Minimum levels. The fact that the geologic record shows that the ice ages ended due to warming trends that proceeded rises in CO2 by 800 years or more is pretty much proof that significant warming can occur with or without CO2 in the atmosphere. Further, during a cooling phase, it is also clear that cooling drives the amount of CO2 in the atmosphere down due to absorption in the oceans. While keeping this in mind, consider that the radiative effects of CO2 are logarithmic. This is why you will often hear numbers like “doubling of CO2 from 280 ppm (parts per million) to 560 ppm would increase radiance to the earth surface by 3.7 watts”. This means that getting to an extra 7.4 watts per square meter (as an example) would require going from 280 ppm to 1160 ppm, and 11.1 watts per square meter would require 2320 ppm. Going in the reverse direction, the same rules apply. Going from 280 ppm to 140 ppm (1/2) would only reduce radiative effects by 3.7 watts per square meter. In brief, the processes that drove temperatures downward by 10 degrees during an ice age were pretty much unaffected by CO2 at 280 ppm. If we were to accept all the arguments in favour of CO2 doubling causing a rise in temperature of one degree, and start with CO2 at the current 380 ppm instead of 280, we would still have the same processes that drive ice ages cause a global temperature drop of about 10 degrees, and we would still have an ice age. In fact, if we use the same radiative physics that was used to calculate that doubling CO2 would increase radiance by 3.7 watts per square meter, we would see that a 10 degree temperature drop into an ice age requires additional cooling of 52 watts per square meter. The notion that CO2 adds 3.7 watts per square meter to the earth’s surface is suspect, the suggestion that this could prevent an ice age driven by a 52 watt decrease is laughable. iPhone App; While the interior of East Antarctica is gaining land ice, overall Antarctica is losing land ice at an accelerating rate. Antarctic sea ice is growing despite a strongly warming Southern Ocean. The in depth article explains that some areas in the Antarctic land mass are losing ice while others are gaining ice. The explanation is that changing weather patterns may be dumping more precipitation in the winter than can melt in the summer, and the size of the ozone hole may be causing a cooling effect. Odd that this cooling effect causes some areas to melt faster in some areas, but let’s put that aside. On land, total ice is defined by how much snow lands in winter less how much melts in summer, so if warming causes a rise in precipitation larger than the rise in melting, this could happen. The sea ice extent is another matter, and it is important to understand what “extent” means. Extent means the total area covered by ice, not the total amount of ice, or its thickness. This is key. Salt water does not freeze over in the same way that fresh water does. In a fresh water lake, cooling at the surface causes water to become more dense and sink to the bottom, bringing warmer water to the top. This continues until 4 degrees C when the water starts to expand again. No more sinking and it freezes with the warmer water below. But salt water doesn’t freeze until -2 degrees and has maximum density at about the freezing point. As a result, a cooling body of sea water continues to send cold water to the bottom and bring warm water to the top until it is almost ALL close to the freezing point. At that point the down welling slows down and the water on top starts to form ice. As a result, even a thin layer of ice forming is indicative of large amounts of sea water having cooled significantly. An expanding sea ice extent is not just indicative of cooling in the atmosphere, it is also indicative of massive cooling in the oceans underneath as well. iPhone App; When the Earth comes out of an ice age, the warming is not initiated by CO2 but by changes in the Earth’s orbit. The warming causes the oceans to give up CO2. The CO2 amplifies the warming and mixes through the atmosphere, spreading warming throughout the planet. So CO2 causes warming AND rising temperature causes CO2 rise. According to the geologic record, CO2 in the atmosphere falls to a low of 140 ppm (parts per million) during an ice age, and a high of 280 ppm at the peak temperature of the interglacial. If we use the same radiative physics that suggest doubling CO2 adds one degree C to earth’s temperature, that means that 8 to 9 degrees of temperature rise coming out of an ice age can be attributed to other sources. This shows once again that the processes that drive temperature on the planet are heavily weighted to factors other than CO2. Further, if CO2 were significant, we would expect that warming would occur after CO2 peaks, just as we expect the warmest days of summer to happen after the summer solstice when sun’s radiance peaks. Instead we see that the moment significant cooling begins, CO2 falls as well. iPhone App; While there are minor errors in An Inconvenient Truth, the main truths presented – evidence to show mankind is causing global warming and its various impacts is consistent with peer reviewed science. iPhone App; the negative impacts of global warming on agriculture, health, economy and environment far outweigh any positives. This point has nothing to do with what is causing warming or cooling of the planet. The historic record does show however, that human civilizations peaked during warm periods and entire empires collapsed during cooling trends. iPhone App; Since the mid 1970s, global temperatures have been warming at around 0.2 degrees Celsius per decade. However, weather imposes its own dramatic ups and downs over the long term trend. We expect to see record cold temperatures even during global warming. Nevertheless over the last decade, daily record high temperatures occurred twice as often as record lows. This tendency towards hotter days is expected to increase as global warming continues into the 21st Century. iPhone App; It is unclear whether global warming is increasing hurricane frequency but there is increasing evidence that warming increases hurricane intensity. 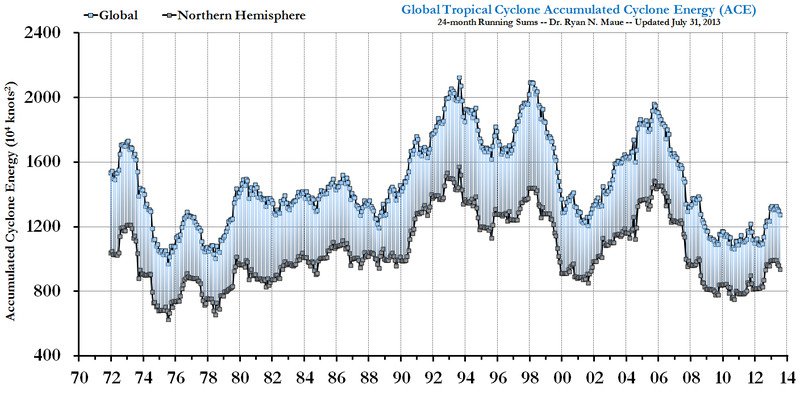 Globally hurricanes have been decreasing in both intensity and frequency since the late 1990’s. If increasing intensity is linked to increasing temperatures, then what the hurricane data suggests is that the globe is cooling. iPhone App; Martian climate is primarily driven by dust and albedo and there is little empirical evidence that Mars is showing long term warming. The point here is that Mars is going through a warming cycle, and since there are no humans on Mars, the warming cycle must be driven by something other than CO2 emissions. Most likely, the warming cycle will be followed by a cooling cycle and the warming is no more long term than earth’s current warming cycle is long term. iPhone App; While the link between cosmic rays and cloud cover is yet to be confirmed, more importantly, there has been no correlation between cosmic rays and global temperatures over the last 30 years of global warming. The last 30 years includes 15 years of flat or declining temperatures, so calling it 30 years of global warming is misleading unto itself. Further, the most recent studies linking global temperature to cosmic rays are based on the last 60 years of data (not 30) and are presented in terms of both cloud cover formation and ozone depletion. While there is insufficient data to prove the linkage, dismissing it on the bases of only half the data collected, and ignoring the combination of effects with ozone depletion that are possible, is misleading. iPhone App; 1934 is the hottest year on record in the USA which only comprises 2% of the globe. According to NASA temperature records, the hottest year on record globally is 2005.
iPhone App; The 1500 year cycles, known as Dansgaard-Oeschger events, are localized to the northern hemisphere and accompanied with cooling in the southern hemisphere. In contrast, current global warming is occurring in both hemispheres and particularly throughout the world’s oceans, indicating a significant energy imbalance. There are many, many cycles affecting the earth’s temperature. These include 11 and 22 year sun spot cycles, the Pacific Decadal Oscillation, variations in the moons orbit of 18.6 years, and many others. The cycles that are induced into the earth’s climate have different results in the northern and southern hemispheres because they are composed differently. The northern hemisphere has most of the land mass and is capped in the arctic by an ocean. The southern hemisphere has most of the ocean surface and the Antarctic is capped by a land mass. As a consequence, oscillations in the southern hemisphere are slower than those in the northern because land heats up and cools off faster than ocean. Sometimes the two hemispheres are moving in opposite directions, cancelling each other out, and sometimes (such as recently) they have been moving in the same direction, and so adding to each other. The oscillations will eventually diverge again, just as they have many times in the past. iPhone App; While urban areas are undoubtedly warmer than surrounding rural areas, this has had little to no impact on warming trends. Since the preponderance of weather stations that have been in the same place for a long period of time are in urban areas, increases in temperature from increasing population density have the obvious potential to bias the data. Having no way to compare to what the temperature would have been in the centre of a large urban city had it not grown in population density is impossible. There are statistical studies being carried out to try and quantify this, and there is a project being carried out as well to identify weather stations that have existed for a long time in rural areas and are properly run in order to isolate their data and come up with a “rural only” data set. This is not as easy as it sounds. For example, in communist Russian, rural towns got fuel subsidies based on how cold the winter was, so many towns forged the temperature record in order to get more subsidies. Validating any given weather station requires considerable work to determine if it was moved at some point, if there was a tree next to it that has since fallen down, and so on. When this data is ready, it will be interesting to compare with. iPhone App; Sea levels are measured by a variety of methods that show close agreement – sediment cores, tidal gauges, satellite measurements. What they find is sea level rise has been steadily accelerating over the past century. To be fair, there is only a little over a decade of satellite data to look at, not nearly enough to determine an over all trend, let alone if it is accelerating. That said, look closely at the last few years of the graph. They are tailing away from the linear trend, showing deceleration, not acceleration. iPhone App; Arctic sea ice has been retreating over the past 30 years. The rate of retreat is accelerating and in fact is exceeding most models’ forecasts. iPhone App; Since the hockey stick paper in 1998, there have been a number of proxy studies analysing a variety of different sources including corals, stalagmites, tree rings, boreholes and ice cores. They all confirm the original hockey stick conclusion: the 20th century is the warmest in the last 1000 years and that warming was most dramatic after 1920.
iPhone App; Water vapour is the most dominant greenhouse gas. Water vapour is also the dominant positive feedback in our climate system and amplifies any warming caused by changes in atmospheric CO2. This positive feedback is why climate is so sensitive to CO2 warming. Water vapour in fact does dominate and this is part of why the CO2 analysis is wrong. For starters, water vapour’s absorption spectrum overlaps CO2. While it is not as efficient as CO2 in that wavelength range, water vapour concentrations in the lower atmosphere are 100 times as high as CO2, so CO2 makes very little difference to longwave absorption compared to what water vapour would have done anyway. In the upper atmosphere, where water vapour concentrations are much lower, CO2 can make a difference. However, the predictions of a positive feedback have not come true. The increase in water vapour has not risen with temperature as expected, and so neither has the positive feedback. In fact the feedback claimed by the warmists is two to one, with one degree of warming from CO2 doubling resulting in two degrees or more of additional warming from water vapour feedback. If we apply those calculations against the actual rise in CO2 since 1920, we would arrive at about a 1.5 degree rise in temperature. We have only seen a rise of about 0.6 degrees though. Even if we attribute 100% of the temperature rise to CO2 (which would be ridiculous) and positive feedback from water vapour, we still arrive at a sensitivity less than half of what is being claimed. If we consider that temperatures rose almost as much in the 90 years before significant CO2 increases in 1920, we would only be able to attribute a tiny fraction of a degree to CO2 and water vapour combined. iPhone App; There are three fundamental flaws in the ‘other planets are warming’ argument. Not all planets in the solar system are warming. The sun has shown no long term trend since 1950 and in fact has shown a slight cooling trend in recent decades. There are explanations for why other planets are warming. The very fact that some planets are warming and some are cooling despite the sun being in a cooling trend is exactly the point. There are many other causes for cooling and warming cycles in something as complicated as a planet, but human activity on planets other than earth is not one of them. To suggest that the same warming and cooling cycles don’t exist on earth and the only thing that makes a difference is human activity defies logic. Further, note the iPhone App’s careful reference to the Sun cooling since 1950. Once again, this ignores what happened previously which is that the Sun increased in activity from 1800 until about 1950, after which it levelled off. Planets being as large as they are (though small compared to the Sun) they don’t just heat up instantly when the Sun does. They continue to heat up for a long time after the Sun’s radiance levels off, which is why only considering solar data since 1950 makes no sense at all when trying to understand influence on climate. very impressed with this post and how well thought out your responses are.